Other Common Names: Turtlehead, white turtlehead, turtlebloom, bitter herb, salt rheum weed, shellflower, snakehead, galane glabre (French), chelone (Spanish), skjoldblomst (Danish), Kahle Schildblume (German), snauskjoldblom (Norwegian), sköldpaddsört (Swedish). Habitat: Balmony is native to Eastern and Central North America and Canada, from Newfoundland to Ontario and Minnesota, and south to Georgia and Missouri. The plant thrives best in moist soil and its natural habitat is often wetlands, such as riparian forests and swamps. Description: Balmony is a perennial plant, belonging to the figwort family (Scrophulariaceae), that can grow up to 40 to 120 cm (2-4 ft) in height. The plant has a smooth, upright stem and oval to lance-shaped leaves that are arranged opposite each other along the stem. The creamy white or pink flowers are produced in terminal clusters and appear in August and September. The shape of the flowers, when viewed from above, resemble a turtle head which is reflected in the plant’s genus name “Chelone” meaning tortoise in Greek and in one of its English common name “white turtlehead”. Balmony is a larval host and a source of nectar for the Baltimore Checkerspot butterfly (Euphydryas phaeton). Plant Parts Used: The aerial parts of the plant are used in herbal medicine. The plant material is collected when the plant is in bloom or when it produces seeds. The herb is then dried for later uses in tinctures and herbal teas. 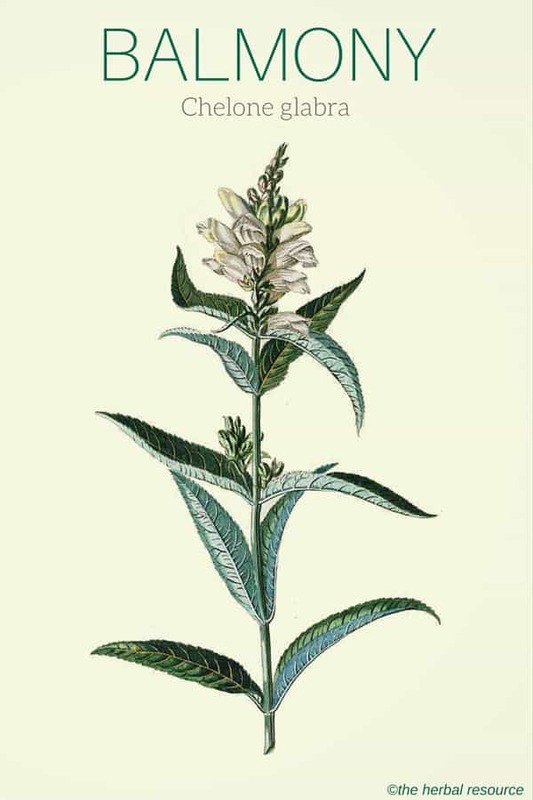 Active Ingredient and Substances: Comprehensive information regarding the plant’s constituents is, as of yet, lacking, but it is known that the plant contains the bitter substances iridoid glucosides such as catalpol (soluble in both water and alcohol) and resins. Balmony has a long history as a medicinal herb in North American folk medicine, but the herb’s alleged medicinal properties have not been backed up by scientific methods and its therapeutic applications are solely based upon traditional uses. Because the herb contains bitter substances it is regarded to helpful in stimulating appetite by increasing the secretion of digestive fluids and it is thought to be of values as a remedy for various liver ailments, and act as a general enhancer for the entire digestive system. Balmony has been used as a natural treatment for gallstones, gallbladder inflammation, and jaundice. It is also regarded to have a laxative effect. Furthermore, the herb has been used traditionally to relieve nausea, vomiting, and colic (intestinal cramps), and as a remedy for indigestion (dyspepsia), general weakness, anorexia and to get rid of intestinal parasites (worms). 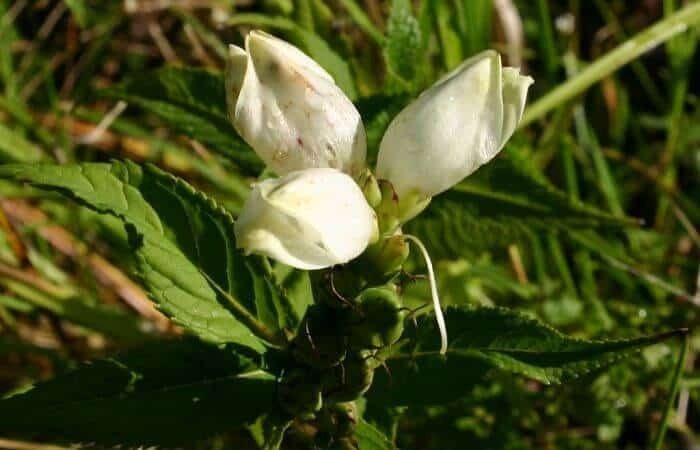 Balmony is viewed as a gentle herb that can be used by both children and the elderly, especially for digestive problems caused by prolonged diseases. There are no reports of toxicity, contraindications or adverse side effects of moderate doses of balmony. No information is available on how the herb will affect pregnant or breastfeeding women. Foster, Steven and James A. Duke: A Field Guide to Medicinal Plants, Eastern, and Central North America. New York, Houghton Mifflin Company 1990. Hoffmann, David: The Complete Illustrated Holistic Herbal. Shaftesbury, Element Books 1996. Hoffmann, David: Herbal Prescriptions after 50. Rochester, Vermont, Healing Arts Press 2007. Hutchens, Alma: Indian Herbalogy of North America. Boston, Shambhala 1991.